The irony is not lost on this farmer that the second leg of these turkeys journey to Thanksgiving began on another holiday...Easter. 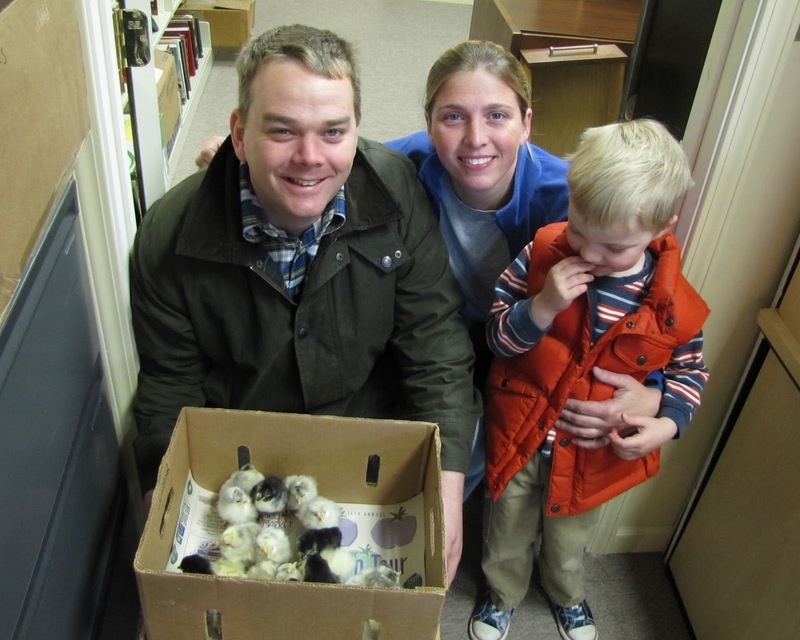 Yep, these turkeys hatched on Easter Sunday. Here you can see in the first photo they have just hatched and are ready for the small temporary brooder in the incubator room. There they will continue to dry out and fluff up, strech their legs from being in that egg, and have their first meal...Easter Sunday dinner of starter crumbles...yum! Here you see the same turkeys on Tuesday as they get moved into the big brooder. They will stay in the big brooder for the next few weeks until they grow their feathers and are strong enough to handle life on the lush green pastures of the farm. In my neck of the woods the statement 'Turkey Season' refers to hunting wild turkeys. However, on my farm it means collecting and hatching eggs for the eventual Thanksgiving Holiday season. I will be blogging over the course of the season about the process of going from breeding flock to Thanksgiving dinner as a turkey farmer. I have raised several heritage breeds of turkey in the past (Narragansett, Bourbon Red, Midget White) but I fell in love with the Black turkeys. Now the Black turkey is the breed of choice on my farm. In managing my breeding flock of about 30 birds, I keep them out on open pasture until February when I know it will soon be time to start collecting eggs for hatching. At that point the birds are moved into portable hoophouse structures where they are secure from predators and the eggs are clean and easy to collect. This year the turkeys began laying a bit late and kept me waiting until the first of April before they really started to lay well. That delay was starting to become a concern because with turkey production for the holiday market you have a short window of opportunity to hatch your poults in, if you hatch too late in the season then your birds do not have enough time to grow and mature to the desired market size. I like to hatch as early as possible in the season and don't hatch turkey eggs after early June. Any later than June and the birds don't have time to grow to a good market size and put on a little fat. A minumum of 24 weeks is what I am looking for as far as a grow out time. So this seasons hatching egg production began a few weeks ago and we are collecting eggs for us to hatch out as well as to sell to a local/regional hatchery that specialized in heritage poultry breeds. When we collect the eggs we are looking for clean eggs that are not oddly shaped. We then store the eggs in a controlled manner until we have enough to set in our incubator or send to the hatchery. Once we have a two week supply of eggs collected it is time to package them for transporting them to the hatchery. Hatching eggs are fragile in more ways than one. We do not want to have the eggs broken in transporting them, nor do we want them shaken up too much, disturbing the potential hatchability of the egg. The eggs are carefully wrapped in tissue paper and placed inside an egg carton with the small end down. The cartons are then taped shutand placed in a box with generous ammounts of packaging material to further protect them during shipping. Ideally they will be shipped with the box upright. Once the eggs arrive at the hatchery they are allowed to sit and rest from all the motion for a day and then placed in the incubator to hatch. Once in the incubator the waiting and monitoring begins. A precise balance of temperature and humidity must be maintained for the next 28 days while the embryo develops and turns into the turkey poult. On day 25 the turning of the eggs will stop and they will be placed in the hatching tray for 3 days. On or about day 28 the poults will hatch out of their eggs and beging the next phase of their journey towards Thanksgiving. Java chicks - just hatched! ﻿﻿﻿ALBC is currently conducting a Java Chicken Recovery Project. 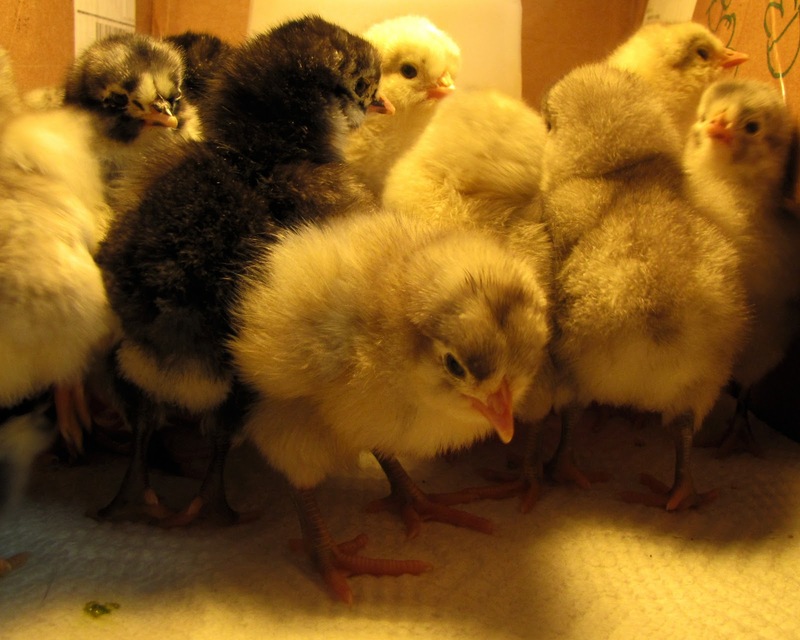 The goal of the project is to utilize established breeding and selection protocols to assist in recovering breed production characteristics for the Java chicken using a pasture-based system of husbandry. Central to this project is to restore the Java to the APA Standard of Perfection for the breed to identify and select for the four distinct color types and to select for rate of growth and egg laying without compromising physical health, fertility, or breed standard. Today the Java chicken is listed on the American Livestock Breeds Conservancy’s Conservation Priority List as “Threatened”. A “Threatened” status means there are less than 1000 breeding birds and less than 5000 birds globally, with seven or fewer primary breeding flocks. The Java wasn’t always an endangered breed, in fact, it was once a highly preferred breed and was widely seen at poultry shows and on homesteads all around the country. The Black Java saw its true peak of popularity from the mid to late 1800s as a market chicken. The reason for the popularity was the black feathering, which required the pin feathers be meticulously removed, this translated as a measure of the quality of plucking and processing. Javas eventually lost favor, but ALBC is working to bring this second oldest American breed back into the limelight. This morning, our first group of Java chickens was picked up by the family that will be growing them out for the project. A number of “growers” are working on the project to help increase numbers and diversity. Stay tuned for more updates about the project!